A free utility to copy evidence files and ensure they are copied in a forensically sound manner. Forensicopy is designed to copy evidence files from one location to another while maintaining the original timestamps (MAC Times). It also creates a hash of all the files before and after the copy process and verifies that the file has been copied accurately. A extensive logfile is generated during the copy process in order to maintain the chain of custody. 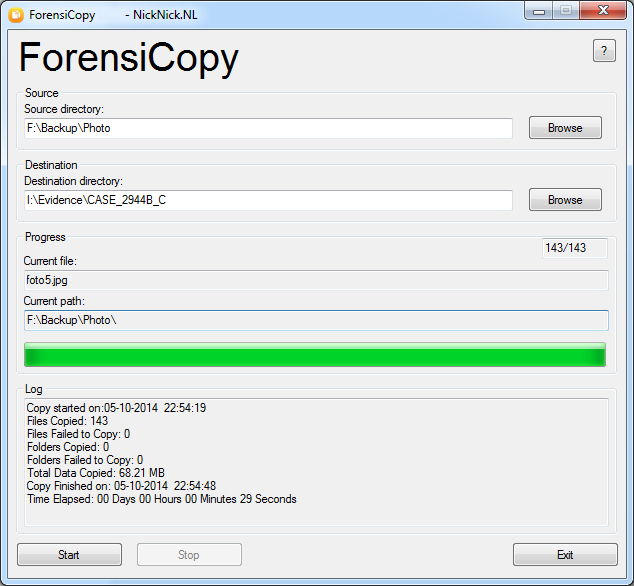 ForensiCopy is designed to copy evidence files. It’s not a substitute for a forensic image. If possible you should always create a full forensic drive image. Only in situations where it’s not possible to create a forensic image it’s recommended to make a forensic copy with a tool like ForensiCopy. Note: By downloading ForensiCopy you agree to the ForensiCopy licence (click to read).